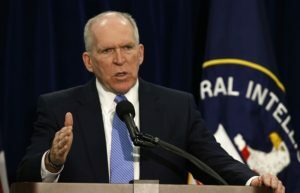 CIA’s Brennan warns ISIL could use Turkish airport strike as template for attack in U.S.
Islamic State of Iraq and Levant (ISIL) is likely to attempt an attack like that on Istanbul’s Ataturk Airport in the United States, CIA Director John Brennan said. “I’d be surprised if Daesh (ISIL) is not trying to carry out that kind of attack in the United States,” Brennan said on June 29. Security officials have taken note of the ways in which ISIL terrorists successfully penetrated security in the airport strike. “You look at what happened in the Turkish airport, these were suicide vests. It’s not that difficult to actually construct and fabricate a suicide vest … so if you have a determined enemy and individuals who are not concerned about escape, that they are going into it with a sense that they are going to die, that really does complicate your strategy in terms of preventing attacks,” he told Yahoo News. Brennan said he believes the group will keep trying to penetrate American defenses and echoed somewhat pessimistic comments he made earlier this month before the Senate Intelligence Committee about the enduring strength of ISIL as a terrorist organization with global reach.